Shoutout to our 2017 Worthy Awards presenting sponsor, Bell Helicopter​! Check out this link to learn more about this year’s sponsorship opportunities. From the pride it brings to your team/agency, third-party credibility and validity it gives to your work and services, and recruitment opportunities it provides for both new business and star employees, it’s difficult to overstate the value of winning a Worthy Award. Draft an outline of what you want to get across before you start writing. The entry system now takes place entirely online, and the allowed copy length for both Programs and Tactics is 1,500 words (1,600 if you include the optional 100-word synopsis). Judges like a clear narrative, so borrow some techniques from PR Writing 101 and emphasize the 5 Ws: Who, What, Why, Where, and When – and throw in a little “How” if you have time and space. Did you “utilize and leverage existing resources to achieve your goals and exceed KPIs?” Well, cut it out. Jargon like that takes up precious space and words, and conveys nothing about what you actually did. How about this instead: “We transformed the streets of downtown Fort Worth into an outdoor art gallery and performing arts venue.” Much better! Skip the big, flowery words, and cut to the chase. Don’t Ignore The Fine Print. Check the category descriptions and entry guidelines to ensure you are covering all of the criteria for the categories you are entering. Keep to the maximum word count (300 per section) and upload only the maximum number of supporting materials (5 per section). Otherwise, you risk annoying the judges at best; at worst — being excluded from the category. There is so much temptation to upload everything, but don’t do it. Choose the best and most impressionable media clips, videos, images, and testimonials to support your case. When you reach the last section of your entry, it’s tempting to make a series of bullets — ad equivalency values, impressions, followers, engagement rates, etc. But the storytelling shouldn’t stop here. Put those numbers in context. What do they mean for your client? How do they contribute to overall business goals? How did the organization and target audiences benefit? Share results beyond numbers — comments, stories, or changes in business practices, for example. The judges might be reading/judging 10-20 submissions. Think about that and put yourself in their shoes before submitting a final draft and make it as easy as possible for them – they will appreciate it and look at your entry in a more favorable light. Make it an easy read with clear objectives. Consider having an internal judging panel assess the entries before they are submitted – if you can’t convince your own colleagues, you won’t convince the judges. Entry tips for the 5th Annual Worthy Awards! The Worthy Awards are back! The annual contest, like those held by other chapters, gives area communications, marketing and public relations professionals an opportunity to honor and celebrate creativity, strategic thinking and professional ability. Worthy entries will be judged by professionals like you who understand the challenges of time, budget, staff and other factors that go into efforts to support our organizations or clients. Don’t be shy; identify your best efforts and enter them. But be sure to allow plenty of time to think about your work from beginning to end and prepare a strong narrative to showcase your project. Explain any type of research. A textbook campaign includes qualitative and/or quantitative research, but that isn’t always feasible or necessary. Judges know this, but they expect your entry narrative to show your knowledge of options and professional literacy. The judges want to know that you observed the public or market, and then thought about how to reach it. Use textbook terminology. For example, best practices review, media audit, literature search, anecdotal reports or even a brainstorming session may be described as secondary, informal research. Explain the strategic purpose of your entry. Was your intent to create name recognition, influence behavior, increase sales, raise funds? Describe any factors about the program or tactic that will help judges understand your decisions. Judges are not likely to be familiar with our market and geographic area, so be sure to include details about population, annual sales, number of employees, consumers, etc., that help them understand the scope of your efforts. Explain which tactics were chosen and why. Remember that the judges won’t know that your tactic was spot-on unless you tell them. If your work required extraordinary skills or a budget challenge, be sure to say so. If media relations are part of your entry, be sure to note that we work in the fifth largest media market in the country (Nielsen) and that there is fierce competition for mass media attention. Describe how the target responded and how you learned about its response. Program evaluation and measurement may be a replication of preliminary research or of other activities. For example, measures can be election results, a sales increase, ROI, donor or donation increase, or the number of participants/responses that exceeded expectations. Include as much measurable and anecdotal response as possible; describe future plans. Or, if the goal was “to generate five media stories,” the result must show five (or more) media reports. If the purpose is “to raise awareness,” the results must show a measurable increase in awareness. http://fortworthprsa.dividesignpros.com/wp-content/uploads/2019/01/GFWPRSALogo2018-300x287.jpg 0 0 Liz Confiliano http://fortworthprsa.dividesignpros.com/wp-content/uploads/2019/01/GFWPRSALogo2018-300x287.jpg Liz Confiliano2016-07-11 10:34:112016-07-11 10:34:11Entry tips for the 5th Annual Worthy Awards! Congratulations to Patsy Thomas, 2015 Communicator of the Year! Patsy Thomas, president of Mental Health Connection of Tarrant County, will receive the Communicator of the Year Award from the Greater Fort Worth Chapter of the Public Relations Society of America at the fourth annual Worthy Awards dinner on Thursday, Nov. 5, at the Fort Worth Club. 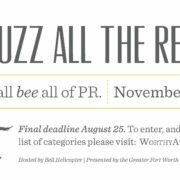 The Worthy Awards celebrate the region’s best in public relations and communications. Members of the critically acclaimed comedy group FOUR DAY WEEKEND will serve as Master of Ceremonies for the awards presentation. A keystone of the Worthy Awards, the Communicator of the Year Award is presented to a leader outside the public relations profession who exemplifies open, effective communication. A committee selected Thomas as Communicator of the Year in large part due to her ability to communicate and create partnerships with public and private agencies, as well as individuals in need of behavioral health services and their family members. The Mental Health Connection of Tarrant County was founded in response to a tragedy in Fort Worth. In 1999, a man entered Wedgwood Baptist Church on a Wednesday evening and began shooting. He killed seven and wounded several others before killing himself. Then Mayor Kenneth Barr asked a group of mental health agencies to develop and implement a plan that could address the mental health issues faced by the killer in an effort to keep anything similar from happening again. The group became Mental Health Connection of Tarrant County and in 2002, Patsy Thomas became its full-time paid president. Today, Thomas is still the only paid staff person of an unparalleled community collaboration that is considered one of the most successful organizations of its type in the country. When many saw “evidence-based practices” as threats, Thomas created a series of symposia designed to bridge the gaps among research, policy and practice. Nearly 200 people attended each, and more than 150 volunteered to participate in Learning Communities responsible for identifying evidence-based practices that would work in Tarrant County. As a result, mental health agencies in Tarrant County are now staffed by more than 100 individuals who provide a number of evidence-based therapeutic practices that had not been available in Tarrant County before. Because of Thomas’ efforts, 54 providers from 13 local agencies are now trained in Trauma-Focused Cognitive Behavioral Therapy. Among the evidence-based practices now available in Tarrant County are several that address childhood trauma. Thomas led the communication effort that resulted in the mental health community focusing on this all-important area. Due to Thomas’ communication and persuasion skills, approximately 900 individuals at 13 agencies are being trained to help teens become more resilient. She also spearheaded development of a public awareness campaign on recognizing trauma in children. As one nominator said, “Because of Patsy and her ability to unite people, Tarrant County’s mental health system is one of the strongest in the country.” Her ability to collaborate with leaders throughout the community, the state and the country has resulted in more than $50 million in state and local grants designed to build a better mental health system in Tarrant County. This year, several strong nominations for Communicator of the Year were received. The following nominees are eligible to be nominated again next year: Dr. Kent Brantley, for his heroic model as a crisis communicator when he became the first person with the Ebola virus to return to the United States; Wayne Carson, Ph.D., CEO of ACH Child & Family Services; Ellen and Tom Harris, founders of the Jordan Elizabeth Harris Foundation to help prevent suicides; Marty Leonard, business owner, board member of the Tarrant Regional Water District and community volunteer; Gary Patterson, head coach of Texas Christian University’s nationally ranked football team; and Janet St. James, former medical reporter for WFAA-TV, who told her personal story of battling invasive breast cancer. Previous Community of the Year award winners are former Fort Worth ISD Superintendent Walter Dansby (2014), Mayor Betsy Price (2013) and former Councilman Joel Burns, who received the inaugural award in 2013. In addition to the Communicator of the Year Award, GFWPRSA plans to present more than 50 awards to area public relations and communications professionals for strategic communications programs and campaigns, including Best of Show. The evening begins with a cocktail reception at 6:30 p.m. and dinner at 7, followed by the awards presentation. Individual tickets are $75 for members, $85 for nonmembers and $50 for students. Tables of 10 are available for $650 at worthyawards.com. The program is sponsored by the Fort Worth Business Press, PAVLOV, Crown Printed Products & Services and Glen E. Ellman Photography. http://fortworthprsa.dividesignpros.com/wp-content/uploads/2019/01/GFWPRSALogo2018-300x287.jpg 0 0 Andrea Hunt http://fortworthprsa.dividesignpros.com/wp-content/uploads/2019/01/GFWPRSALogo2018-300x287.jpg Andrea Hunt2015-10-20 14:24:312015-10-27 14:08:17Congratulations to Patsy Thomas, 2015 Communicator of the Year! The Worthy Awards are designed to provide area communications, marketing and public relations professionals with an opportunity to celebrate creativity, strategic thinking and professional ability. Don’t be hesitant about entering. Think about your activities between January 1, 2014 and June 30, 2015, and go for it. Here are some tips for preparing your entry. The judges (Cleveland’s PRSA chapter) will look at each required area and base their scoring on how well the four entry areas are explained. Entrants should address each required point, and thoughtfully explain their good work so that it is excruciatingly clear to judges not familiar with our area. Explain any type of research, and why it was used. A textbook campaign would include formal, original research, but that isn’t always feasible or necessary. Judges know this, so entrants should clearly describe what was done. For example, a brainstorming session, a review of media clips or discussions with clients may be described as secondary, qualitative research … literature review … content analysis … anecdotal reports. Why did you do what you did? Possible reasons are to increase sales, raise funds, create name recognition or influence public behavior. Describe any factors about the project/tactic that will help judges understand the purpose and the market. Note that the purpose must – absolutely must – match the outcome. Read on to the Evaluation section. Explain which tactics were chosen and why. When there are several tactical options, the entrant should state, for example, that “these tactics were selected to expand the reach of our message,” identify and justify each tactic. Remember that the judges won’t know that your decisions and efforts were special unless you tell them. Another hypothetical example: If your target market/public prefers electronic media over print, your entry should state, “Secondary research found that our target demographic prefers to receive electronic communications.” Such data may be obvious to you, but your entry narrative also must make your decision obvious to the judges. Here’s where to explain who wrote the copy, designed a magazine, edited content, provided photos, approved the budget and negotiated with a vendor. The tactics section of The Worthy Awards is an explanation of who did what. If an unusual price or component was negotiated, say so, so the judges will understand your extra effort. Tactics are created to meet a specific need, and are skillfully and professionally prepared. An evaluation of effectiveness and impact, based upon defined objectives, can be simply stated. However, the results must – absolutely must – match the purpose. If the purpose was “to generate five media stories,” the result must show five (or more) media reports. If the purpose is “to raise awareness,” the results must show a measurable increase in awareness. Explain how the targeted market, public or audience responded and how you learned about its response. This is the time to include quantitative data and analysis. Such measures may be a replication of preliminary research or measures of other activities. For example, measures can be election results, a sales increase, ROI, donor or donation increase, or the number of participants/responses that exceeded expectations. Include as much measurable and anecdotal response as possible, and describe future plans. Information below on Communicator of the Year will be available soon. Please check back. Good luck to everyone. See you at the Nov. 5 awards presentation. Join us for our next GFW PRSA luncheon on Wednesday, February 13, at Colonial Country Club!